[by Róisín Curé] Recently I was invited to sketch at a vintage car show. I was thrilled to be asked: I'd long admired the work of masters such as the late Florian Afflerbach and others, and I wanted to give it a go myself. Turns out it's not as easy as I thought. Why didn't my sketches turn out as I would have liked? The fact is that I didn't enter the zone, where something outside of yourself seems to guide your hand as you sketch. Was that because I was distracted by my wonderful sketching companions on the day? Was it the fact that I have to up my game a bit and just try harder to get it right? Sure, but I think it was more than that, because I often draw with lots of distraction, and besides even the least slick of sketches can be beautiful. I think it's because I'd been asked to present a finished sketch to the event organisers for a charity raffle at the end of the day, so I felt I wasn't free to mess about, opening the portal to that wonderful zone. That zone is far less likely to happen if you're trying to make a formal painting for someone else. It's a matter of inspiration, the capricious Muse that sprinkles her magic on everything she inspires us to draw, a magic you can see. Now, I'm very lucky in that the muse seems to hover nearby most of the time, but commissions are notorious for frightening her off. I do a lot of commissions and I need to be proud of them, so I've developed a way to get around the problem. I make "just for fun" sketches in my sketchbooks rather than drawing on the final paper. When the drawing turns out well - and it invariably does if I do it that way - I can easily transfer it to a formal sheet of heavy quality paper with my light box, tracing over barely-visible lines with my favourite fountain pen. And I'm in good company. The master illustrator Quentin Blake always uses a light box to capture the fluidity and spontaneity of preparatory sketches, and Felix Scheinberger says that he tells himself that whatever he's working on is just a preparatory sketch. But the option of a light box wasn't there for me at the vintage car show on the day. I had come prepared with a big fancy sheet of heavy watercolour paper and although the passers-by seemed impressed, I am less than happy with the results. I know we're not supposed to do our own work down, but that kind of thing is irrelevant to me - I only care about honouring my subject in the best way I can. There were beautiful cars, trucks and tractors of every description everywhere I looked. But I barely saw any of them because I was too busy sketching. I barely saw the display of owls and falcons, because I was sketching, and I even missed the fluffy baby rescue owl who only wanted to stand on her handler's feet and face inwards with her eyes closed, according to my daughter. I missed the antiques stalls and the threshing demonstration, Seán Keane and his band on stage and basically everything else. And the sketches? 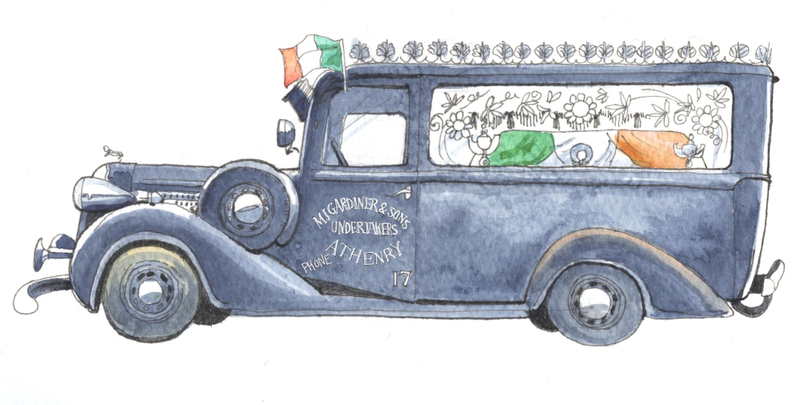 I drew a hearse that was built in 1936. 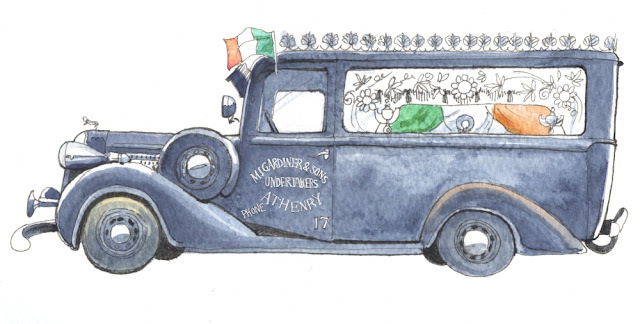 The number 17 appears on the passenger door, a phone number from the days when you only needed to remember two numbers to phone someone in Galway. "If you phone that number now, no one would answer," said a passing man drily. The man who had recently purchased this beauty had an "occupant" in the hearse. "Come and see," he said to me. He peeled off a corner of the Tricolour and revealed...a hay bale. 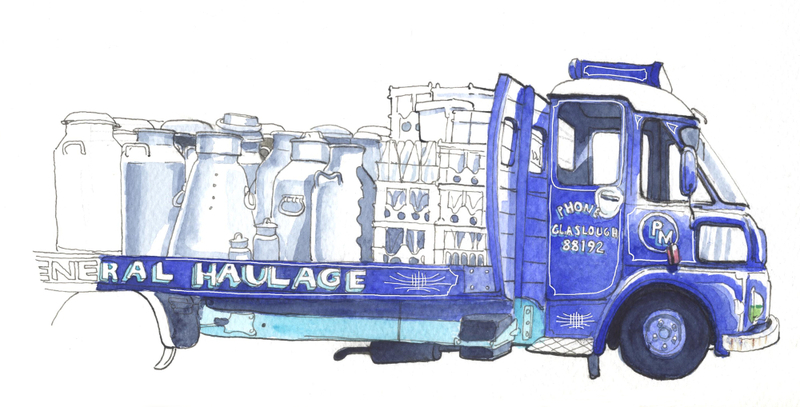 Then I drew the wonderful milk float you see at the top of the page. It brought me back to the days I spent in the Gaeltacht in Donegal as a ten-year-old, when the milk for the cornflakes would be brought in from the yard, still warm and frothing from the cow. An acquired taste, but one I did acquire...what a far cry from the various nut milks I drink now. Not even sure which I'd prefer - but I know either is preferable to the ubiquitous grim plastic containers that our low-fat milk comes in now. Wouldn't it be infinitely nicer to pour your milk from a chubby glass bottle? So that's my experience. But if you've made it this far, here's a happier story. It was warm and balmy on the day, and I was surrounded by sketchers young and old stretched out on the grass, including some from Urban Sketchers Galway and our respective daughters, all of whom sketched away happily. A husband of one of the sketchers treated us all to tea and coffee and bottles of water, the most sunny and generous of men. My daughter's puppy was patted and petted by everyone who passed, and spent much time having his tummy tickled. An urban sketcher drove across the country from Dublin to be with us, and enjoyed the exhibits as well as his sketching experience. My daughter had a ball, choosing nice things to eat from the food stalls, bringing her puppy everywhere she went, teaching him new tricks (he can now add "Right paw!" to his repertoire) - and sketching. 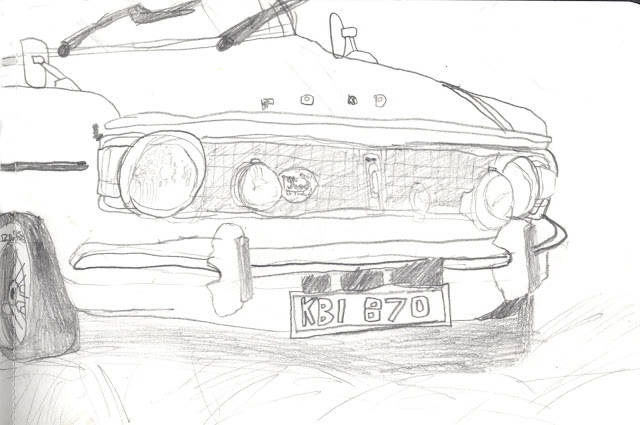 Look at her beautiful drawing of an old Ford...I'm so proud of her. She just drew away so naturally and easily, looking after her puppy and chatting to her pal all the while - distraction clearly didn't affect her at all. I'm off to Galway County Show next Sunday. It'll be mostly horses and agricultural stuff but there will probably be the odd vintage car if the weather is nice, and there's a dog show. My daughter Liv and I are going, we're entering the puppy into the dog show, and yes, I will bring my sketchbook, but this time the sketches will be just for my own pleasure. As urban sketching should always be.